John Tavener's name is perhaps most associated with works inspired by the Orthodox liturgy and, more recently, by other religions but this new disc from Matthew Owens and Wells Cathedral Choir, on Signum, presents Tavener in Anglican mode with a group of remarkable late works written specifically for the Anglican liturgy. Central to the disc is Tavener's Missa Wellensis which is performed with his Preces and Responses, Magnificat and Nunc Dimittis 'Collegium Regale', plus a number of smaller works including The Lord's Prayer, Love bade me welcome, Psalm 121: I will lift up mine eyes unto the hills, Song for Athene, Prayer for the healing of the sick, and They are all gone into the world of light. 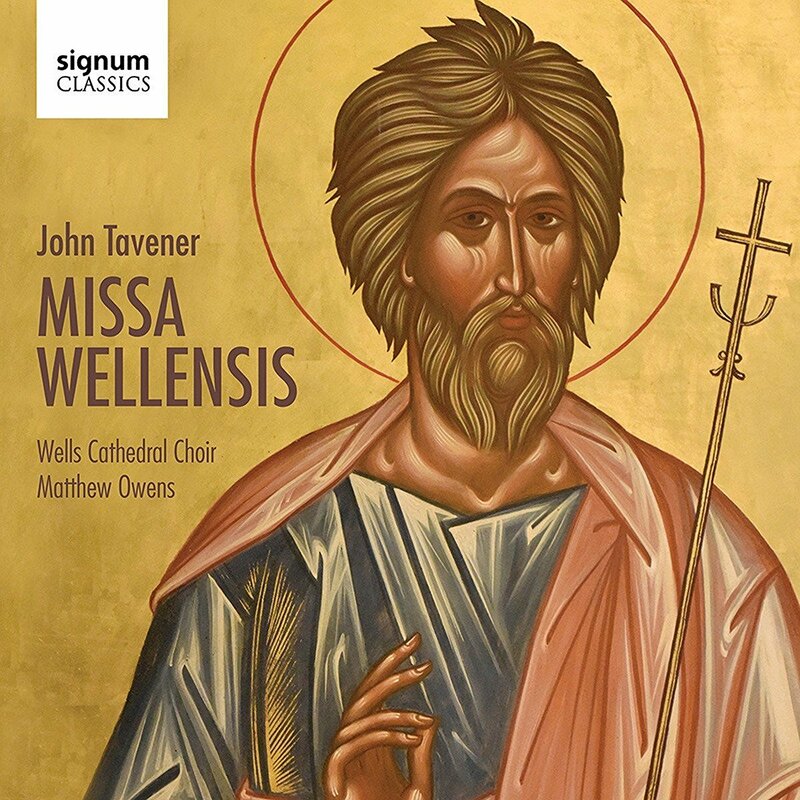 The Missa Wellensis, which was written for Wells Cathedral in 2013, opens the disc and then Owens and his choir weave the remaining works into a sequence resembling Evensong in order to give the Preces and Responses the right sense of structure. Wells has both a choir of trebles and a girls choir, and on this disc they use both and for the large scale works (the mass, Magnificat and Nunc Dimittis and the Preces and Responses) the lower parts are supplemented with five extra singers to create a choir of 43. Tavener's Missa Wellensis is the longest and most substantial of his late works, written for double choir, and intended as a tribute to the music of Victoria. It lasts around 17 minutes with the 'Kyrie' being the longest of the movements. The length of the 'Kyrie' and the work's sheer complexity suggest that it is very much a special occasion piece. Tavener uses complex textures to create bold blocks of sound, with contrasts of extremes of dynamics. There is very much a sense of striving and strain, I suspect deliberately so particularly in the 'Kyrie'. But the final 'Agnus Dei' opens austerely with a single line (shared between voices) which is in fact a 12-tone melody. Tavener's Magnificat and Nunc Dimittis 'Collegium Regale' were written for King's College, Cambridge in 1986 and, with the encouragement of the then Dean, Tavener included in the Magnificat the refrain 'Greater in honour than the cherubim' which is sung between verses in the Orthodox service of Matins which creates a very different feel to the structure of the piece, binding Tavener's disparate treatment of the different verses together. There are plenty of references to Orthodox style chant in the work, and the Magnificat very much feels hieratic rather than celebratory whilst the Nunc Dimittis is rather contemplative. The other major late work on the disc is Tavener's Preces and Responses which was written in 2014, again for Wells. We hear the work divided up, split into three parts as it would be in the service of Evensong. Tavener's writing here is very stately, so that the second part last a whopping nine minutes because of the slow and rather thoughtful setting of the 'Lord's Prayer'. There are some striking moments in the piece, and some very vibrant textures as Tavener clearly responds to particular words or phrases, though to get the real feel for it you still need to hear it in context of a service. Threaded throughout the disc are a series of shorter works. The Song for Athene is perhaps the best known of Tavener's smaller works on the disc, and its texture is one which pops up in various other works. There is a rather thoughtful setting of George Herbert's Love bade me welcome, commissioned in 1985 for the enthronement of the Bishop of Winchester and revealing some of Tavener's fondness for striking parallelisms in the harmony, creating a texture familiar from a number of his smaller works. Yet the treatment of Herbert's words seems a little too careful and steady. The Lord's Prayer which exists on its own (rather than being part of the Preces and Responses) was written for Christ Church, Oxford in 1984 and consists of a simple recitation where the single line gradually opens up to create a work which is austere, yet intense. Psalm 121: I will live mine eyes up to the hills, written for St Paul's Cathedral in 1989, uses familiar Tavener textures to create strong intense blocks. The Prayer for the Healing of the Sick was written in 1998 and, like Song for Athene, uses a text by Mother Thekla. In this piece a solo bass (Christopher Sheldrake) intones in dialogue with the choir, whose responses are akin to Song for Athene. They are all gone into the world of light is a setting of a text by Henry Vaughan which Tavener wrote in 2011. The work goes from simplicity to intense, edgy harmonies and back again. John Tavener had the knack of writing extremely characterful and profoundly moving smaller works for choir. This disc gives us a welcome opportunity to hear some, particularly the late works. Matthew Owens and his choir bring a lovely poised tone to the more straightforward works on the disc, making the music glow. But there is no denying that works like the Missa Wellensis are taxing, particularly in a choir without adult sopranos. You feel that other groups will undoubtedly take it on board, but it is very satisfying to have the impressive and vibrant performance from the choir for which it was written.